A default Role/Roles allows you to specify exactly what a newly registered person can do once they have registered. Defulat Roles allow you set up automatic entry and login into the site, through to the user requiring activation before they can login. 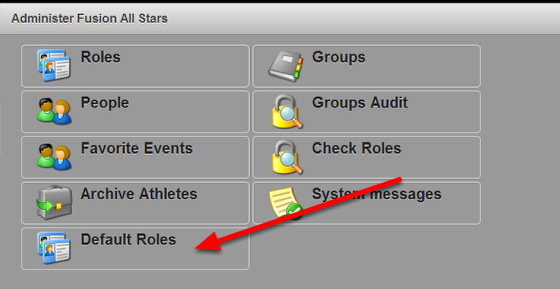 On the Administration Site Click on "Default Roles". DO NOT click on Roles, these are separate. You need to name the Default Role. This Name will appear on the register page for the new user to select. Now select if they will be automatically activated, and if this is a coaching role. 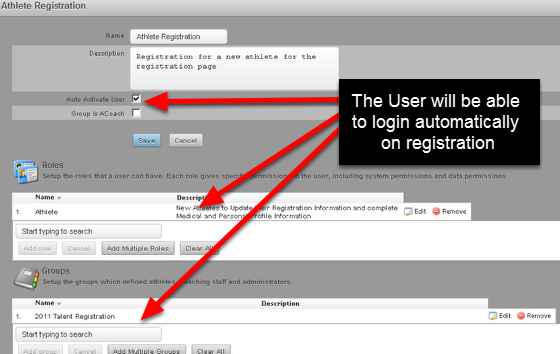 The Autoactive Button is set up so that if you tick it, you do not need to Activate their account on the Administration Site after they register. Once they register, they will be able to login automatically as long as you have also set them up with permissions to access the site (e.g. they are set up with a role and a group). If the Autoactive Button is unticked, you will need to activate their account by logging into the Administration site and ticking the active button in their account. 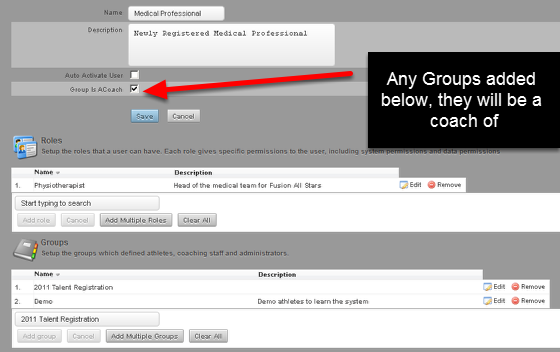 The Group is ACoach is set so that if you tick it, the newly registered user can access a group of athlete's data (e.g. a test athletes group) (shown in an image in a step below). 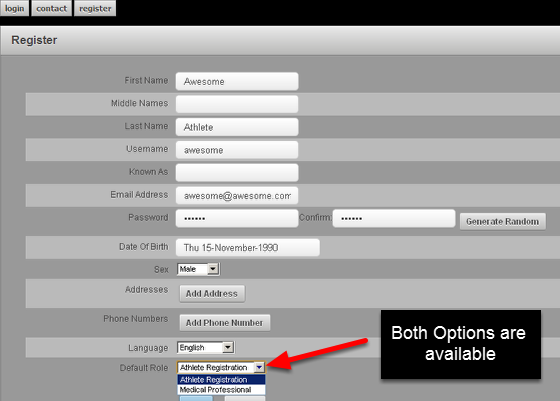 You would use this button to set up new Professionals with access to the correct groups and roles, but you would need to set the activate button to unticked so that other people cannot just register and the be able to login immediately and access existing athletes' data. Never tick BOTH the Autoactive and Group Is ACoach for an existing group of athletes in case someone registers who is NOT supposed to. If you do, you could be giving access to confidential information and you will be breaking data protection act laws. 3: They will be added to the 2011 Talent Registration Group so other professionals can access their data. The example here shows that a new Medical Professional Role has been set up. The Autoactive button is not activated, so when they register, the Administrator will be sent an e-mail and the Administrator will need to login to the Administration Site and activate their account before they can login. The user is automatically added to the Physiotherapist Role and as a Coach of the 2011 Talent Registration and Demo groups because the Group is ACoach has been ticked. Be Warned: ALL default roles that you set up in this Default Roles section will appear on the registration page, so you MUST test each of your roles once you create them to ensure have set them up correctly. All of the default roles that you set up will show on the Registration Page. This means you may only want to create one default role. 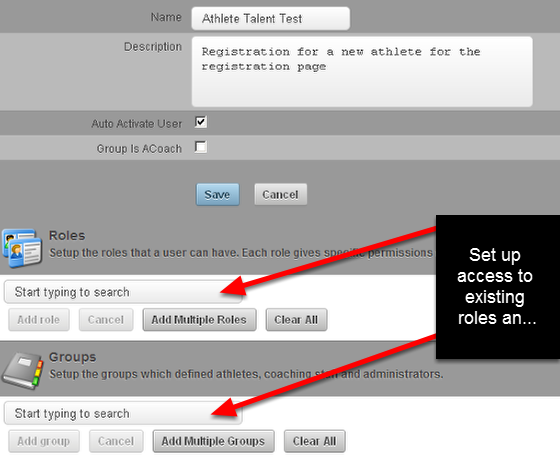 If you set up more, then you need to check that any default roles that you create will not enable automatic access to any other athlete's real data. 1: An athlete to access their own data, so it does not matter if a doctor or physio accidentally chooses this login. 2. A Medical Professional Role is set up so that their account requires activation. The administrator has to login and activate their account before they can login. This also give the chance for the administrator to check that the user is accessing the correct groups and Roles. If you have ANY concerns ask your distributor. You need to be confident that you are safely allocating access to your site and your data.